Long-overdue consolidation is driving change in Myanmar’s dynamic airline sector. There are currently five airlines operating in the domestic market compared to eight a year ago and 10 three years ago. Five is still a large number, given that less than 3 million passengers fly within Myanmar annually, but the recent wave of consolidation should drive a major improvement in market conditions. Profitability, which has been unachievable this decade by virtually all airlines in Myanmar, is now a possibility and some of the remaining competitors should be able to accelerate expansion. Myanmar’s largest private airline, Air KBZ, is planning to expand its fleet by 50% this year and aspires to overtake government-owned Myanmar National Airlines (MNA) as the largest domestic competitor. Air KBZ’s sister airline Myanmar Airways International (MAI) is also planning to double its fleet in 2019, ending a long period of no growth. Myanmar’s airline sector has started to go through a period of long-overdue consolidation as four airlines have exited. A fifth airline has not operated in recent weeks and could result in the number of domestic competitors reducing to a more sustainable four. Air KBZ is resuming fleet expansion in 2019 and, as the largest private airline, could benefit the most from the recent consolidation in the domestic market. Air KBZ’s sister airline Myanmar Airways International is also resuming fleet expansion in 2019 and could regain its former position as the largest competitor in the international market. Current market leader Myanmar National Airlines has slowed down fleet expansion but is also relatively well positioned to benefit from the consolidation. 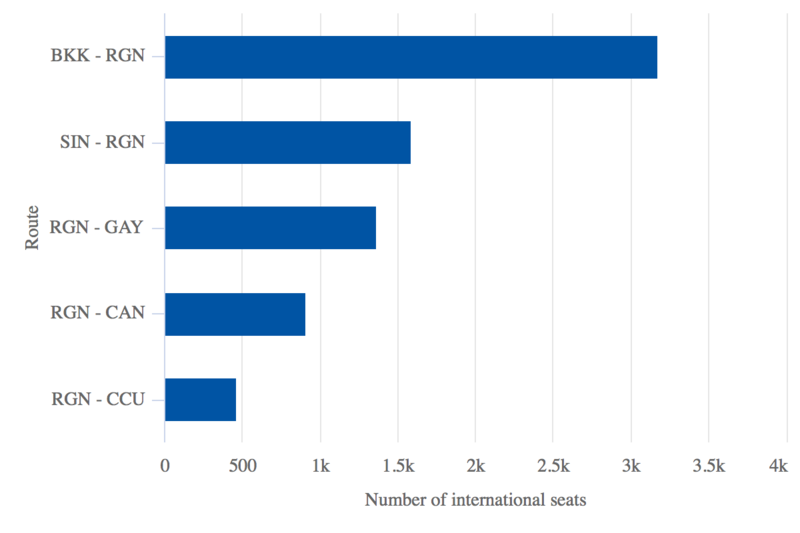 Myanmar’s aviation market consists of less than 8 million annual passengers; in 2018 there were 2.7 million domestic and 4.5 million international passengers (based on Myanmar CAA data). Foreign airlines dominate the international market, leaving Myanmar-based airlines to fight over a pie of less than 4 million annual passengers. Three years ago there were a staggering 11 Myanmar-based airlines, including 10 domestic competitors. On average, each airline carried only 300,000 annual passengers – a clearly unsustainable scenario as CAPA has pointed out in several prior analysis reports on the Myanmar market. Consolidation proved elusive for several years. Instead the number of airlines steadily increased, from four at the end of 2010 to 11 at the end of 2015. An overdue consolidation phase started in 2016 when Air Bagan suspended operations, but did not become significant until the past 15 months as three more airlines exited. APEX suspended operations in late 2017, followed by FMI and Air Mandalay in 2H2018. All four of the airlines that have so far exited were privately owned domestic competitors. APEX and FMI were the newest entrants, having both begun their operations in 2015. Air Bagan and Air Mandalay were among the four airlines that were active back in 2010. The seven remaining airlines are Air KBZ, Asian Wings, Golden Myanmar Airlines, Mann Yadanarpon Airways, Myanmar Airways International (MAI), Myanmar National Airlines (MNA) and Yangon Airways. MAI only competes in the international market, leaving six domestic competitors. However, Asian Wings has not operated any flights in the past several weeks, resulting in five active domestic competitors. While this could be a temporary situation as Asian Wings has not yet returned its operator's certificate, it appears the airline could be on the verge of exiting the market permanently. Asian Wings shrank significantly in 2018 and filed a significantly reduced schedule for the winter season (starting Oct-2018) that included only 31 weekly sectors, the equivalent of 2.2 return services per day. None of these flights have operated for approximately two months. Asian Wings’ fleet peaked in 2015 at five aircraft (four ATR 72s and one A321) but the schedule it operated in 4Q2018 only required one aircraft. The airline denied reports in Aug-2018 that it was suspending operations. However, the very limited schedule it offered in the 2H2018 indicates that the airline has been struggling and the recent hiatus in operations is again sparking rumours of a permanent suspension. Asian Wings, Air KBZ, Golden Myanmar, Mann Yadanarpon and Yangon Airways are all privately owned. In recent years they have only competed in the domestic market, although previously most have operated limited international services. Yangon Airways is the oldest of these airlines, initially launching services in 1996. However, the airline suspended services in 2010 before relaunching a year later in 2011. Air KBZ and Asian Wings launched in 2011, in the first wave of expansion for Myanmar’s airline sector. Golden Myanmar followed in 2013 and Mann Yadanarpon in 2014. Golden Myanmar, Mann Yadanarpon, Yangon Airways are all very small. Source: CAPA – Centre for Aviation. Golden Myanmar’s published schedule for the winter 2018/2019 season consists of 126 weekly sectors (the equivalent of nine return services per day) and requires two aircraft. Mann Yadanarpon’s winter schedule includes 137 weekly sectors, which also requires two aircraft. Yangon Airways’ winter schedule consists of 139 weekly sectors but requires three aircraft during certain times. Airlines in Myanmar generally offer more flights in winter than summer due to lower demand in the monsoon months. Air KBZ is the largest of the private domestic competitors but smaller than government-owned MNA. Air KBZ currently operates six ATR 72s (five -600s and one -500) and therefore has at least twice as many aircraft as all the other private airlines. The airline also has the most destinations (13) and the most weekly sectors (170) among the private competitors, based on the current schedules. MNA has a leading 27 domestic destinations and more than 200 domestic sectors. MNA operates single engine Cessna Caravans to exclusive smaller destinations, providing a subsidised service to rural areas that private airlines are not able to serve viably. MNA is also the largest competitor on most domestic trunk routes, which are mainly operated with ATR 72-600s, although E190s and 737-800s are used on some peak flights. MNA were among the original airlines operating in 2010, although at the time MNA was known as Myanma Airways and only operated in the domestic market. MNA expanded into the international market in 2015 and rebranded. In 2017 MNA become the largest Myanmar-based international airline, overtaking MAI. 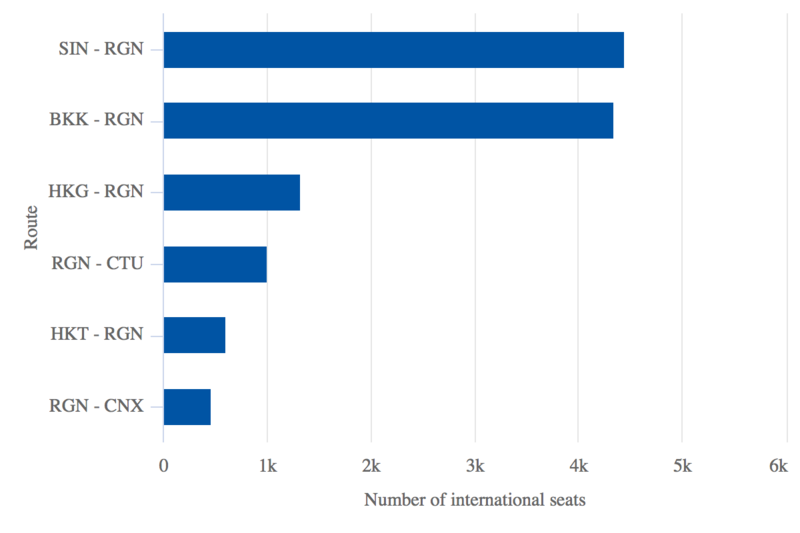 MNA currently has approximately an 8% share of international seat capacity in Myanmar, compared to 5% for MAI. Foreign airlines account for the remaining 87% (based on CAPA and OAG data for the week commencing 4-Feb-2019). In the domestic market, MNA has a more than a 30% share and Air KBZ has a more than 20% share. Golden Myanmar, Mann Yadanarpon and Yangon Airways each have approximately 15%. The domestic capacity share figures are all rough as there is considerable deviation from published schedules and cancellations are common. Domestic airlines in Myanmar have typically consolidated or combined flights, particularly during offpeak periods. Airlines operate similar schedules on trunk routes, making it easy to accommodate passengers on another airline. Air KBZ is the most aggressive of the remaining domestic competitors. Air KBZ plans to expand its fleet by three aircraft in 2019, whereas some of its competitors appear to be cutting back. Air KBZ’s new fleet plan includes two ATR 72-600 deliveries in Apr-2019 and two more in Jun/Jul-2019. The airline plans to return its one remaining ATR 72-500 in Aug-2019, resulting in a fleet of nine aircraft, compared to six currently. Air KBZ plans to introduce a new schedule later this year featuring several new point-to-point routes and four new destinations overall: Homalin (HOX), Khamti (KHM), Kyaingtong (KET) and Myeik (MGZ). In particular, Air KBZ plans to pursue expansion at Mandalay, where at least one of the additional aircraft will be based. Air KBZ pursued rapid expansion after launching in 2011 and quickly became Myanmar’s largest private airline. However, its fleet shrank in 2018 after reaching a peak of eight aircraft in 2016 and 2017. Air KBZ’s passenger traffic declined by 10% in 2018 to 612,000 and the number of departures dropped by 16%, to 14,766. Air KBZ therefore has not yet benefitted from the consolidation. In fact, its market share declined in 2018 despite the reduction in the number of competitors. Total domestic traffic in Myanmar dropped by approximately 5% in 2018, driven primarily by weaker demand. Air KBZ’s schedule for the current winter season is still below that of winter 2018. However, KBZ’s capacity in summer 2019 and winter 2019/2020 is expected to reach new highs. Air KBZ is targeting a 15% increase in passenger traffic for 2019, to 704,000, driven by significant growth in the second half of the year. Similar growth is likely in 2020, driven by the full year impact of the larger fleet. Air KBZ aims to overtake MNA to become the largest domestic airline. This could become achievable in 2020 – assuming it follows through in implementing the new fleet plan. Air KBZ has not yet secured any of the four additional ATR 72-600s but is confident it can complete four lease transactions over the next few months, since there is currently a glut of available aircraft. MNA has apparently stopped expanding and has been reducing its fleet in recent months, which could help Air KBZ achieve its objective of becoming the largest domestic airline. From 2015 to 2018 MNA took delivery of eight new ATR 72-600s, which were used to phase out older model ATRs and grow its domestic operation. MNA operated one ATR 42-320, two ATR 72-200s and one ATR 72-500 before taking its first ATR 72-600 in 3Q2015. However, one of MNA’s ATR 72-600s was removed from service in Oct-2018 and has not operated any services since. It appears this aircraft is being returned to its lessor and it is possible that a second ATR 72-600 could be returned, reducing MNA’s ATR fleet to six aircraft. MNA is also now seeking to sell its last ATR 72-500, which has not operated in a year. The ATR 72 is the backbone of MNA’s domestic fleet and is also the only aircraft type used by all of Myanmar’s privately owned domestic airlines. MNA previously operated some domestic services with Fokker 70 regional jets, which were replaced with two secondhand E190s in late 2012 and early 2013. MNA has already pursued significant revisions to its narrowbody fleet plan, resulting in slower international growth. The airline initially committed to 10 737s from GECAS in early 2014, being six 737-800s for delivery in 2015 to 2017 and four 737 MAX 8s for delivery from 2018. GECAS is also the source of its two E190s. However, MNA has not taken delivery of any additional jets since early 2017, when the fourth 737-800 was delivered. MNA has since dropped its commitment to the last two 737-800s. Its order book still lists the four 737 MAX 8s but it is unclear when these will be delivered, and if will still receive all four aircraft. At the very least, the 737 MAX 8s have been deferred, considering that first delivery was originally slated for 2018. The suspension in narrowbody fleet expansion is sensible as MNA’s international operation has so far been highly unprofitable, generating an average load factor of less than 50% since it was launched in Aug-2015. MNA should focus on improving utilisation of its jet fleet and achieving profitability before resuming narrowbody expansion. There is still room to pursue some international expansion using its four existing 737-800s and two E190s as these aircraft are not yet being fully utilised. MNA launched thrice weekly services in Dec-2018 to Chengdu, its first destination in China, and is keen to add more flights in the fast growing China-Myanmar market. More China routes can be launched using the four existing 737-800s as these routes can be operated during overnight hours. Yangon-Chengdu is the first route for MNA operating during overnight hours. Its other international routes are all operated during the day: Yangon-Bangkok (twice daily), Yangon-Singapore (twice daily), Yangon-Hong Kong (four times weekly), Yangon-Phuket (three times weekly) and Yangon-Chiang Mai (three times weekly). Bangkok, Singapore, Hong Kong and Chengdu are operated with 737-800s, Phuket is served with E190s, and Chiang Mai with ATR 72s. MAI was the original Myanmar flag carrier but was privatised in 2010. Kanabawza initially acquired an 80% stake in MAI in 2010 and acquired the remaining 20% from the Myanmar government in 2013. The government subsequently backed MNA's ambitious international expansion plan, essentially making MNA the new flag carrier. Kanabawza has long had aspirations to grow in the international market but focused on domestic expansion after launching Air KBZ in 2011. Under Kanabawza MAI has not expanded, and its market share has steadily declined although the overall international market has tripled in size. MAI's traffic has fluctuated between 300,000 and 400,000 annual international passengers over the past several years. In 2018 MAI’s international traffic dropped by 16%, to 329,000. The airline is not currently operating any domestic services but previously had a limited number of Yangon-Mandalay flights to reposition aircraft for international services from Mandalay. MAI is planning to resume expansion in 2019, which could enable it to regain its previous position as the largest Myanmar-based international airline. MAI’s 2019 fleet plan includes three additional aircraft, which it hopes to put into service around the middle of the year. MAI currently operates three two class 136-seat A319s but is looking at larger gauge A320 family aircraft or 737 family aircraft. Specifically, the requirement is for two 170-seat two class aircraft (A320s or 737-800s) and one 200-seat aircraft (A321 or 737-900). It is mainly planning the lease of secondhand aircraft but is also considering new aircraft, including re-engined A320neos/A321neos or 737 MAX 8/9s. MAI has flexibility to switch to Boeing as all three of its A319s are old (17 to 19 years) and have leases that are about to expire. The lease on one A319 recently expired but was extended for six months, while the other two leases are expiring in early 2020. The three aircraft in the MAI fleet plan for 2019 are all growth aircraft (at least for now). MAI could potentially acquire more aircraft in 2020 to replace its ageing A319s. MAI operates only four year-round routes: Yangon to Bangkok (twice daily), Singapore (once daily), Guangzhou (four times weekly) and Kolkata (twice weekly). It also has a seasonal service to Gaya which caters to religious pilgrim traffic. MAI is aiming to launch five new routes in 2019 and grow international passenger traffic by 17%, to 395,000. More rapid traffic growth in 2020 is likely, driven by the full year impact of the routes and aircraft added in 2H2019. MAI is particularly keen to expand in China, which is by far the fastest growing market from Myanmar and overtook Thailand in 2018 as the largest source market. It is also considering potential new routes to South Korea, which is Myanmar’s third largest source market, but that hinges on acquiring re-engined narrowbody aircraft (A320neos or 737 MAX 8s) because current generation narrowbody aircraft lack the range to operate form Myanmar to Korea without payload restrictions. New destinations within Southeast Asia are possible but not the priority, given the intense competition in most Southeast Asian markets. India is not being considered, although MAI (at least for now) is planning to maintain Kolkata, which it launched in late 2016, despite new upcoming competition on this route from IndiGo. Although North Asia is generally more attractive, expansion there will also be challenging because of the competition from foreign airlines. As MNA has discovered, competing against foreign airlines in Myanmar’s international market is very difficult. Foreign airlines enjoy bigger economies of scale and strong distribution networks in their home markets, which is critical as most international traffic to Myanmar consists of inbound visitors. MNA, and now MAI, are trying to differentiate their products in the international market by offering domestic connections. MNA has the largest domestic network in Myanmar and one brand, making international-domestic connections relatively seamless. MAI has started leveraging its sister airline Air KBZ’s domestic network and offering a domestic to international connection product. MAI and Air KBZ began codesharing in 2017 and are now jointly managed. However, so far codeshare volumes have been low. The two airlines are hopeful of generating more cross-traffic as they work to integrate and improve their connection product. Separate brands and operator's certificates are being maintained (at least for now). MAI has the distinction of being the only IOSA-certified airline in Myanmar, which helps it attract codeshare and interline traffic. As part of its international expansion plan MAI is now working on growing its partnership traffic. MAI has codeshares in place with six foreign airlines (Asiana, Korean, Garuda, Malaysia Airlines, Royal Brunei and SriLankan) and interlines with 32 airlines. However, the volumes generated by nearly all of these agreements are now very small. Transitioning Air KBZ to the MAI operating certificate would make sense as it would enable MAI to offer domestic connections to its foreign airline partners. The current Air KBZ domestic operation would also come under IOSA under a merger (Air KBZ could also pursue IOSA certification separately), which should help the airline attract higher yielding domestic traffic. Myanmar residents pay significantly lower domestic fares than foreigners (USD50 per sector for locals, on average, vs USD90 for foreigners). Not surprisingly, Air KBZ is hoping to increase its mix of foreigners. Working more closely with MAI, working with MAI’s international partners and securing IOSA certification would help Air KBZ's average domestic yield – at an important juncture, given its upcoming domestic expansion. An outright merger with MAI would be ideal as it would help KBZ achieve its domestic market objectives while also generating synergies that would improve the airline group's profitability. Air KBZ and MAI have the opportunity to emerge as the market leader in Myanmar’s colourful airline sector and expand rapidly. The airline group clearly is in a position to benefit from the recent wave of consolidation, as well as from the anticipated growth in the overall market (domestic and international). However, stiff competition from MNA, the remaining private operators and aggressive foreign airlines are still a threat.